Good Morning! Occupy Wall Street has apparently migrated up to Nyack, of all places – more proof that people need to find more constructive things to do with their lives. In a Journal News photo of the “protest” in Nyack, there are at least three people with signs that have some version of “Expose the 9/11 Cover-Up.” If anyone can explain to me what that has to do with the big financial players on Wall Street, I’m all ears. Driving the Day: In a survey conducted by consulting firm Deloitte of nearly 700 executives from mid-sized firms (meaning those with between $50 million and $1 billion in annual revenue), more than 75 percent of those surveyed say they plan to either maintain or boost capital investment over the next year. Also of note, 40 percent of those queried say they plan to hire workers, albeit while keeping an eye out for people with specific skill sets. Local Angle: I talked about this in my last post, so I’ll keep it short here, but business confidence in Westchester is at a new low for the post-recession crowd, according to the Business Council of Westchester / DataKey Consulting Business Confidence Index. Many of the county’s small businesses – which comprise 70 percent of the total firms in Westchester – do not fit into $50 million to $1 billion in annual revenue category that Deloitte looked in to in its own survey. Those local small firms are struggling with the exceedingly high cost of doing business in Westchester, something that we will continue to look into over the next several weeks at the Business Journal. Things ranging from health care to unemployment insurance to taxes are pricing small businesses out of Westchester, and until mandate relief becomes a reality business owners will continue to struggle. For the full story on the BCW/DataKey Business Confidence Index, see here. For a look at whether mandate relief is coming from Albany, see here. National Outlook: For the first time in months, analysts are revising GDP projections upwards rather than downwards, with Bloomberg News reporting this morning that a number of economists are predicting 2.5 percent GDP growth during the third quarter (rather than 2.0 percent growth, which was the previous consensus). See the full article here. What this means, the analysts say, is that chances of a double-dip recession are, well, dipping. High-fives all around! Driving the day, Part 1: Gov. Andrew Cuomo has been on a hot streak lately – much unlike the Red Sox (more on that later in this post). So it was inevitable that he was eventually going to get a setback. Well, that setback came on Tuesday evening, just after his announcement that five major tech companies would be investing $4.4 billion in local R&D and manufacturing facilities. On Tuesday, the Public Employees Federation, which is the state’s second-largest public employee union with 56,000 members, rejected its proposed 5-year contract with the state that would have guaranteed members protection from layoffs in exchange for three years of no raises plus paying a higher percentage of healthcare costs. Whether or not you agree with the union’s vote, 3,500 pink slips went out yesterday. This is exactly when we CANNOT afford to cut jobs – particularly at the government level when so many are already being lost. Driving the day, Part 2: On Wednesday, the Justice Department asked that the Supreme Court – SCOTUS for short (don’t you love acronyms) – rules on “ObamaCare” ASAP. In other words, look for a ruling in early 2012, which, as all of the networks have hammered home, comes smack in the middle of the campaign. Health care affects jobs, and with small businesses hurting, the consensus is that ObamaCare will add to the pain. Jobs in turn affect the economy, and well, folks, 99.9 percent of the time that is exactly what an election hinges on. So yes, this is a “big f****** deal” (quoting our friend Joe Biden) for the president. By the Numbers: 1.3%, as in the level of GDP growth in the second quarter of this year, up from a previous estimate of one percent growth. Sports Blink: Last night, the Boston Red Sox completed the biggest regular-season collapse in MLB history for team in playoff contention. The Sox led the AL Wild Card race by 9 games on Sept. 3, but from there they went 7-20 in the month of September. They now have several months to work on their golf games and their excuses between now and spring training. 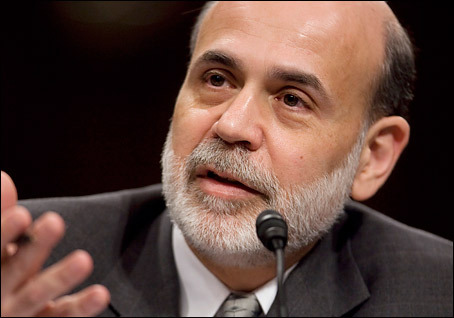 Fed Chairman Ben Bernanke spoke. Markets, apparently, were listening. As of 12:15 pm, both the Dow and the S&P 500 were up at least 1.39% on the day after opening in the red. In more “upbeat” news (please note the muted sarcasm here), Bernanke urged that while the recovery “may take some time,” the U.S. economy can “reasonably expect” to see a return to economic growth rates and employment levels that were last seen prior to 2007. Now, my apologies, but it is time to come back down to Earth. Consumer confidence for August in the U.S. fell to a 55.7 mark in the Thomson Reuters/University of Michigan monthly index, down from a 63.7 mark in July. Also announced this morning, the U.S. economy only grew at a 1% rate in the second quarter of 2011, down from initial estimates that put GDP growth at 1.3%. In a recap, the economy grew at a 0.4% rate in the first quarter, and a 1% rate in the second quarter. That, folks, means that the U.S. economy averaged below 1% growth in the first half of this year.